I assume you already have your Gmail account by now. Also, you should have secured at least 2 valid IDs last month which was the most “quiet” time of the year for most government offices. (Note: November is the best month to get IDs, papers, etc. from government offices – though that is in Davao but I think it represents the trend of other cities in the Philippines). Most of my clients found Philhealth, DFA(passport)and Postal Office the fastest way to get an ID. If you don’t have a bank account yet then its time to save that 13th month bonus or gifts from “ninongs and ninangs.” You MUST have a savings account even if you are not interested in setting up an online business. You might be wondering why I included this on the list. Let me tell you MY story so you’ll understand why: when I started my online business I used several physical/mailing addresses. It’s not because I’m too rich to have many houses but my family don’t own any house(I didn’t came from a rich home) so some of my contact info is set on my aunt’s address, another to a friend and the other to our local church. Checks, payments, notices, etc. from Paypal, online merchants, etc. were delivered in different addresses which is really a hassle. This might not be a problem to you but make sure you only use ONE physical address in all your correspondence relating to your online business. So, same address you’ll use on your bank info, Paypal account, business info, etc. Also, make sure that the address you use don’t have any problems. Some addresses have problems receiving stuff – they just don’t arrive(typical for the Post Office). Of course, your EON card may not look like above since they change the design sporadically. 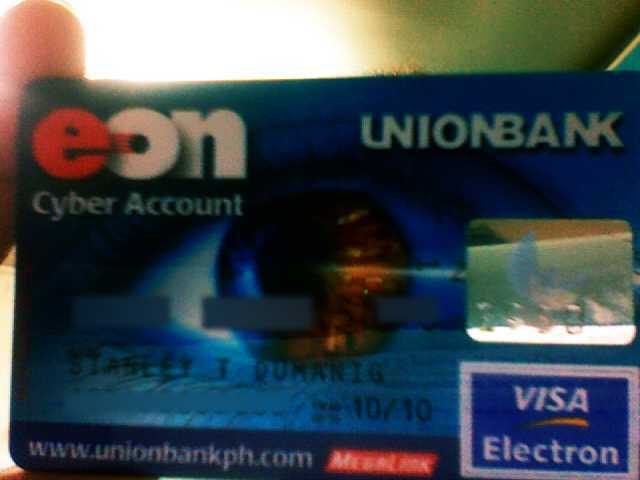 Just make sure that when you visit any Unionbank branch that you ask them to give you an EON account. As of this writing, there is NO monthly maintaining balance for the EON account but you’ll have to pay $7 (Php 350.00) annually. You will be using this card only ONCE – that is to activate your Paypal account. Once it is activated, you may have the option to continue using your EON card to withdraw funds from Paypal or you may use other banks. Any international credit card can also be used to validate your Paypal account. Try all your debit/credit cards first because they might work but if not EON is the best bet. For Filipinos abroad, check with your local bank if their debit/credit cards support Paypal. As a general rule of thumb, Mastercard and Visa cards work with Paypal. Again, you’ll only use the card once then you have the option on what bank account to use. NOTE: I opened accounts with BPI and BDO since they also have debit/credit cards. However, both doesn’t work with Paypal with the exception of their international credit cards – that means higher monthly registration fee. You can definitely withdraw money though from your Paypal account to your BPI and/or BDO account among others. I have two discussions in this item: “owned or rented” and “MAC/Linux or PC/Windows”. You should have your OWN computer. However, if budget is tight this won’t prevent you from starting your own online business. Having your own computer means your data is safe with you, you can work anytime and you’ll save more money long term. When I started my online business I don’t have a computer. My previous employer issued me a laptop so I bring the laptop at home(on which I’m authorized) to work on my online business. Sometimes I went to an internet cafe and work there. Do NOT let technology stop you. Own a computer if you can but you can still work by renting a computer. Aim to invest for a computer though – it is real worth investment. Though MAC and Linux are two different operating systems I treat them as one in general since both of them are built from Unix and both don’t get affected with any virus, spywares or adwares. I’ve been in the computer industry for more than a decade and I used MAC, Linux and Windows. Each of them have strengths and weaknesses. Some techies will tell you that OSes don’t matter and its just a matter of preference. I beg to differ. One thing I really don’t like on Windows is that it can caught a virus. There’s an anti-virus, right? Yes, there are BUT still some can get through. I don’t like fighting viruses especially in the middle of a project! In my experience, 90% of Windows users who have anti-virus software installed in their computers were still hit by a virus. Slow apps, blue-screen-of-death and worst data loss. Oh no! What a terrible day! Nonetheless, your operating system must be dictated on what application softwares you’ll use. However, if possible, look for similar programs for MAC or Linux(which most are free) then stay away with Windows. I now use MAC and Linux exclusively. I still use Internet Explorer(a Windows program) for my web design business but that app is running on Wine(a Mac/Linux app where it allows Windows programs to run). Here’s the core of this article and this is probably new to you. I should have created the 3rd series with only this item discussed since there’s a lot to talk about this. Rather, I’ll give you an overview of this program so you just can understand it and get started then I’ll talk more about this in the future. Don’t worry I’ll give you the meat! Paypal enables you to send and receive money. It can accept credit card payments online. Paypal is a merchant account and a payment gateway in one. Don’t worry about what online merchant account and payment gateway is since we don’t have it in the Philippines yet. In the U.S. and other highly-developed countries, merchant account can be a different company with the payment gateway but for now let’s focus on Paypal which has BOTH. Once payment has been approved, the amount will be credited to your account(immediately visible in your Account History page) and then you’ll be notified via email that a sale had been made. You can check your balance online by logging in to your Paypal account. [Note: This is why you should have your OWN computer for security reasons and should avoid Windows since some virus/spyware can capture your login info]. I’ll only discuss the first two. If you think you’ll have a total monthly sales of $10,000 then you NEED to get the Business account. Personal accounts are absolutely free but you are only allowed 5 credit/debit card transactions in a 12-month period. The transaction fee is about 5%. Sending and receiving money from a Paypal balance though remains free and without limit. Its free to open a Premier account or upgrade from a Personal account. You are also allowed virtually unlimited credit/debit card transactions. The transaction fee is about 3% which is half the fee of traditional merchant accounts. For detailed figures, visit this link. I would advise you get a Personal account AND a Premier account. Don’t worry. You are allowed to have two accounts as long as one is a Personal account. You will be using two different cards for the two accounts though. So, if getting a credit/debit card is a hassle to you then first get the Premier account. You can withdraw your Paypal funds to any participating bank if your account is activated/validated. Remember, the Unionbank and debit/credit card above? That is why its important to have those so you can withdraw your money to your bank. To know more about Paypal visit www.Paypal.com and create an account now. Whew! Finally, I already given the complete list. WHAT’s NEXT? DO YOUR ASSIGNMENT! Once you have nailed all these then you are very close in earning your first few dollars online. In the next articles, I’ll be giving some ideas and tips on how to find a good and “responsive” market and how to promote your business. Lastly, please let me know what you thought about our site – use the comments section below this article. Also, subscribe to my RSS feed via email and tell your friends about this site – they’ll thank YOU for it. I am new and green but want to set up a internet site for info and another for certain professions that I can promote. Truth is, is that I have so many ideas, that it is hard to pick one. I am trying to get some real basic info before making the decision I want to followup on. Question: When a webmaster or someone adds content, articles and newsletters to their site, are they taken from the source or can they be taken (stolen) off any other site out there that is using them and applied to yours to keep your site current? 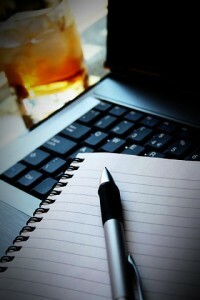 What is the difference between a white paper and an article? Alvin: Great hearing from you! Its great to connect again. Soccer days were like just yesterdays. Anyway, I’m SURE you will have your OWN market there in Japan, perhaps, in the Philippines too! On content, you MUST not steal ANY content or else that would mean copyright infringement. You can, however, post an excerpt of the original post with the author’s permission and link to the original post. This is a very helpful article. Thanks for coming up with something like this. By the way, we’ve got some good news for you. Starting July 23 to August 22 2010, enjoy a 5% rebate on all ebay purchases using your UnionBank VISA Debit Card! If you want to ask for more details regarding EON Card, you can visit our website at http://www.unionbankph.com or you can also visit and be a fan on our facebook.com/unionbankph or follow us on twitter @unionbankph. @Unionbank: Thanks for the update and for dropping by! I’ll sure contact you in the future as I would like to have you speak in some of our events. Online business is such a tough start for young entrepreneurs. I indeed experience it, you cannot predict world wide web, when starting an online business you must learn research and plan for it carefully before you start it. I hope many people can read you article.